JOE LOUIS ARENA FAREWELL SEASON photo picture art print for sale. 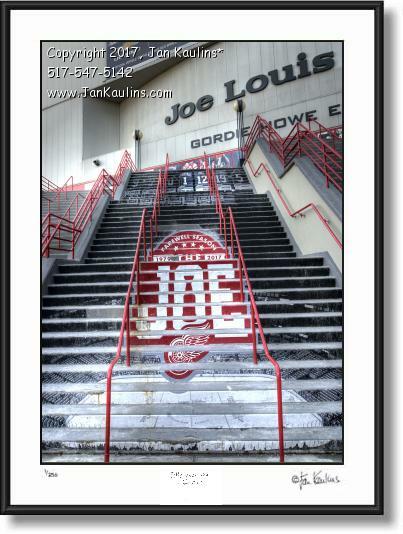 This JOE LOUIS ARENA FINAL FAREWELL SEASON photo picture art poster print for sale is of the Gordie Howe Entrance steps that were painted as a tribute and historic memorial for the DETROIT RED WINGS JOE LOUIS ARENA FINAL FAREWELL SEASON. In the center of the steps we see the logo for the Detroit Red Wings Farewell Season at The Joe Louis Arena and towards the bottom of the stairs we see a large black and white image of the inside of this historic structure. The Detroit Joe Louis Detroit Red Wings Arena opened in 1979 and will end with the Farewell Final Game on April 9, 2017. This is a wonderful artistic multiple exposure portrait of this historic Detroit Red Wings Joe Louis Arena during its FINAL FAREWELL SEASON. This artistic JOE LOUIS FAREWELL FINAL SEASON photo art picture print for sale was made from nine multiple exposures by long time Detroit area photographer Mr. Jan Kaulins. This photo is a wonderful tribute to the end of an era.